"A simple easy-to-make cheesecake served with a yummy Pecan Caramel Sauce. It's perfect for holiday get-togethers." In a large bowl, combine 1/4 cup butter, wafer crumbs, and white sugar. Press firmly on the bottom of a 9 inch springform pan. In a large bowl, beat the cream cheese until fluffy. Gradually beat in the sweetened condensed milk until smooth. Mix in the eggs. Stir in 1/4 cup rum, vanilla extract, and nutmeg. Pour into the prepared pan. Bake in preheated oven for 40 to 50 minutes, or until center of cake springs back when lightly touched. Allow to cool, then chill. 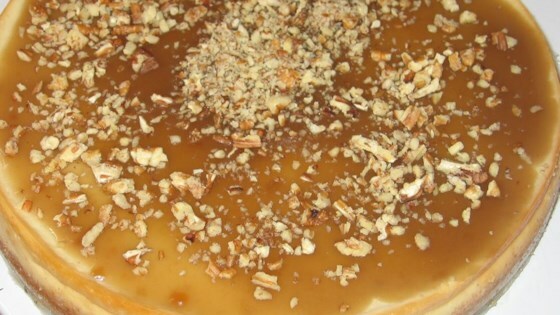 To Make The Pecan Caramel Sauce: In a small bowl, dissolve the cornstarch in 1 cup of water. In a medium saucepan, melt 2 tablespoons butter. Stir in brown sugar and the cornstarch mixture. Bring to a boil, stirring constantly. Reduce heat, and simmer for 10 minutes. Remove from heat, and add 2 tablespoons dark rum. Allow to cool. Just before serving, stir the pecans into the sauce. Remove the sides of the springform pan from the cooled cheesecake. Serve with the Pecan Caramel Sauce. This yummy treat is for all the eggnog fans out there! It may be easy, but it is way too rich. We couldn't finish it. The Sauce was also very runny. Not one I will make again. Gave this to my grandfather for Xmas. He froze it, then thawed out a slice for after dinner every day until it was gone and raved about it! This got rave reviews at the last event I brought it to. However, the rum flavoring was a little strong for my taste, and I would probably tone it down next time. This was sooo good. This was the first time I ever made a cheesecake and it came out perfect! It was very easy and I plan on making it again this Christmas. It was wonderful and very rich. I thought the pecan caramel sauce was the best part. We loved this. I changed it a little and made it with a grahm cracker crust because that is what I had on hand, and used caremel ice cream topping too. It was very creamy and smooth. Mmmm!